Xeros Ltd's washing machine uses less than 2 percent of the water and energy of a conventional machine. A new washing machine that uses just a cup of water, a pinch of detergent, and about 1,000 small plastic chips to clean clothes may be available for consumers in the UK next year. Researchers at Leeds University designed the machine, which will be marketed by a spin-off company called Xeros Ltd (which means "dry" in Greek). Company founder Stephen Burkinshaw, a professor of textile chemistry, explains that the machine will reduce both water and energy consumption. Currently, washing machine use accounts for 13 percent of daily household water consumption in the UK, or about 21 liters (5.5 gallons) of water per day, according to the UK organization Waterwise. Besides saving water, the Xeros machine uses just 2% of the energy of a conventional washing machine. And since clothes come out nearly dry, they don´t require the use of a dryer. "We have shown that it can remove all sorts of everyday stains, including coffee and lipstick, while using a tiny fraction of the water used by conventional washing machines," Burkinshaw said. When doing a load of wash, users throw their clothes in like a normal washing machine. Then a cartridge in the back of the machine adds plastic chips - about 45 pounds (20 kg) of them - to the load. Next, a cup of water containing the detergent is added. After the water dissolves the dirt, the chips absorb the water, without the need for a rinse or spin cycle. When finished, a grill at the bottom of the machine opens to collect the chips. According to Xeros, the chips can last for about 100 loads of laundry, or about six months for an average family. The company has not yet provided details on what the chips are made of, or how easily and safely the chips can be disposed of or recycled. Working with Leeds University´s commercialization partner IP Group, Xeros has secured an investment of almost 500,000 pounds ($984,400) for the project. The price of the Xeros washing machines for consumers is "not expected to be dramatically different from (conventional) washing machines," according to the company. ""The company has not yet provided details on what the chips are made of, or how easily and safely the chips can be disposed of or recycled. "" It sounds like the chips absorb the dirt and detergent along with the water? If so then what happens to it. 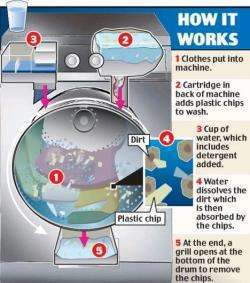 Do the chips begin to leach the dirt back into clothes after repeated washes. How many cups of water can the chips absorb? Does the water evaporate from the chips or do they fill up. Inquiring minds want to know. I seem to recall back in the late 70's early 80's someone had developed a washing machine that used ultrasound but that required no detergent only water. I guess the detergent companies weren't to fond of that idea. For this kind of durable good, with such guaranteed traction in consumer markets, proof of concept would be sufficient for investors to go from prototype to larger scale production, baring a toxic waist show stopper. Without the best patent insurance law firms, the early disclosure of trade secrets by publication or patent guarantees a complete lack of protection or funding. Whether or not you believe China's economy rode in on Microsoft's piriated software, as early as the 1980's the patent & copyright process was a smorgasbord for Asian entrepreneurs. The fines were either completely avoidable or dwarfed by returns in local markets. Think of global entrepreneurs as corporate members of the World Trade Organization, with diplomatic immunity to common law in foreign nations. Think of the 800 pound Gorilla, the Magna Charta, and other explorers historic pillaging of weaker villages; then you'll understand modern economies never fool mother nature. Ya, seems like the chips would get caught within the cloths,.. but then again no details on the chips. They must use hydroscopic plastic chips to absorb the water, then the chips must be dried afterwards with dessicant or heat. Again how is the dirt separated with only a cup of water? I'm worried about the detergent that's not being rinsed away. That stuff causes allergies in a lot of people, and depending on what's in it, might not be good for you at all even if you aren't allergic. Seems that this would work for superficial cleaning of simple, smooth fabrics. But thicker, deeply dirty and complex articles would fare less well. Think of a load of children's denim after a rough go at the playground. Or deeply sweaty gym towels. Unless the chips are so small that they can slip between the individual fibers, I can't see it doing much of a job. And of course the chips will eventually need to be cleaned or disposed of(dry cleaning solvent typically gets cycled through many large loads before being disposed of.) And I can't quite understand how the machine separates the dirty chips from the clothes. I just hope the chips aren't some mechanism for delivering some gastly Fabreeze-like chemical nastiness into more nooks and crannies of our lives. 1) How much is this washer machine going to cost the consumer? 2) What happened to the Japanese washer of a few years ago that used ultrasonics? It was already in production when I read about it. As an old garbageman, I always suggest to entrepreneurs that they think backwards -- what wastes will they generate, what is their composition and what will happen to them? If you don't think backwards, wastes first, you are not thinking at all. Sadly this would get derailed by marketing firms and dumb consumers. Just look at a breakfast cereal box. The box is pure waste. Then the bag is about 4 times too big. The contents (food) is biodegradable. So effectively it is a box of pure waste.